The signature at the end of my email is a four sentence quotation from Louis Penney: the four sentences that lead to wisdom. I’m sorry. I was wrong. I don’t know. I need help. Along with signing off that way, I try to use them whenever possible. Wisdom is elusive but I am ever hopeful. The most frequent three-word phrase in both British and American spoken English turns out to be I don’t know, according to corpus research. Both of those claims may be accurate. In his book Gifts of the Dark wood, Eric Elnes has a chapter entitled The Gift of Uncertainty. The chapter begins with a quotation from Brian McLaren: certainty is overrated. I borrowed a text and an interpretation from Barbara Brown Taylor and suggested that Nicodemus, when he visits Jesus in John 3, is not condemned but rather is taught that if one is born of the Spirit one has to live with uncertainty. The Spirit, after all, blows where it chooses and we certainly cannot control it and predict where it will go. Too many people want to know, or claim to know, exactly who God is and what God has in mind. Perhaps they are correct. Perhaps they are claiming to know more than Jesus does. They may. For me, the life of faith has a certain amount of uncertainty. That is the point. The opposite of faith is not doubt. They opposite of faith is certainty. Do a simple web search on that topic and be surprised at where the Spirit may take you. I am glad I am not a staffer being asked to give advice. It is hard for me to know what I would tell Al Franken. If he wishes to model good behavior, should he resign? Should he resign and ask Governor Dayton to choose a woman to replace him as a symbolic, and probably helpful, gesture? Or should he stay in the Senate and face the ethics probe? Most people in his position would resign as a way to end the "trouble." The behavior we see most often is an out of court settlement and a resignation. On the other hand, going before the panel, having already apologized, we would get to see a public figure take responsibility for their past actions and accept whatever happens next. We celebrated All Saint’s Sunday by naming those who died last year – members, relatives of members, and others who were important to us – and showing slides of them to call up their memory. We gave thanks for their lives and prayed for those who mourned their death and remembered their life. I have always found Wesley’s use of scripture, tradition, reason and experience as sources for theology useful. On All Saint’s it is experience which comes to the fore. What we know of God and grace and the practice of the faith we know through those who have embodied it for us. The yare the source of our experience. If we can, we should give thanks for what we have received. Of course sometimes we cannot. We look back and we wish that we could change the past. We cannot. But as one of my teachers told us: turn the wish, or the demand, that the past be different into a preference. “I wish it had gone this way…” I asked people to remember someone who would have done things differently if they had been there and then to tell themselves that they would have preferred that this person had been present. Changing our language and expressing a preference can move us out of the past. More often, at least for me, I can give thanks. The blessing is that we mourn people who lived lives we wish we could imitate. In another letter Paul gives us a list of qualities worth demonstrating: the fruit of the Spirit is love, joy, peace, patience, kindness, generosity, faithfulness, gentleness, and self-control. Of course there are others. The list is incomplete. I regard those as disciplines: works I need to practice. To help with my practice, I visualize, I remember, people who had those qualities and how they used them. I cannot be them but I can copy them and hope. 4. In most current this-worldly matters, it is possible to know the difference. 5. The one who is untruthful in little will also be untruthful in much. 6. When someone contradicts any of the above, wake up and take note: you have glimpsed the face of the author of lies, and in this moment you will declare your allegiance. We all do it every day, and our cumulative choices define us. Lord, please make us instruments of Your transforming love. help us sing loud songs of courageous friendship. let us form a resounding multi-faith choir of generous inclusion. Empower us overcome their noise with our hymn of praise for this beautiful earth. Let us crescendo with a new song of resilient hope. Twin Cities radio talk-show host Bob Davis has lost an advertiser and is being offered an all-expenses-paid trip to Newtown, Conn., to repeat what he said on the air recently: that the families who lost loved ones in the Sandy Hook school shooting can “go to hell” for taking a visible role in the national debate on gun control. Joy Gresham, in Shadowlands, responds to a comment by asking what I believe to be the only appropriate question when hearing something such as that: "Are you trying to be offensive or are you just stupid?" It does seem a little unusual that the risen Jesus needs to eat so much. Or maybe he is only eating for our sake. Read the story. Read it slowly - as though you had never read or heard it before. Maybe you have not. What words or phrases catch your attention? What would you have felt or done if you had been one of the disciples. What word from God is present for you in these words from Luke? Jesus keeps appearing to the disciples. So how do they know it is “really” him? Some people claim God has spoken or appeared to them. How do we know if they should be believed? If God speaks to you how do you know it is God and not the evil one? William Stafford's Easter Morning raises the same question. I do not think we should answer too quickly or let others convince us too quickly: God is indeed mysterious. But for me, my "tests" when I test the Spirit/spirits are always things like: Am I being asked to do or say what I really really want to do or say anyway? If so, probably not Jesus telling me to do it. Is the person who will pay the biggest price for this me or someone else? Someone else -then probably not. Am I being fed and then asked to feed others? Could be Jesus. Am I being consumed and then feeding on others? Probably some form of evil. Jesus asks for fish and bread to prove he is real and not a ghost. We are his people because we have been fed and nourished by him. It is really him when we have nourishment, not words or criticism or orders, but nourishment to give and share and eat ourselves. I am the pastor of UCC church in the southwestern suburbs Minneapolis. I have always admired the Methodist observation that whether we claim it or not, all Christians have our faith shaped by scripture, tradition, reason and experience. No one just “believes in the bible” I have also admired the comment attributed to Karl Barth: “Take your Bible and take your newspaper, and read both. 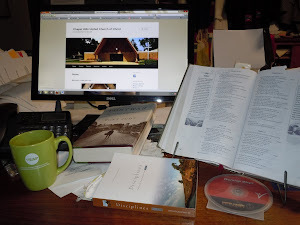 But interpret newspapers from your Bible.” I could not fit all of that into blogpost headline, so I settled for scripture and web news and dark roast. Coffee fuels many a muse – particularly mine.